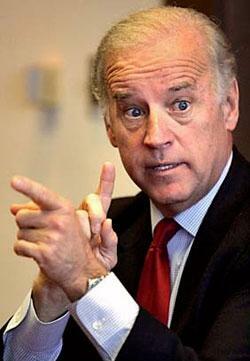 Joe Biden has a long history of verbal flubs, but this one may take the cake. ‘The Taliban, per se, is not our enemy,” Biden said. That’s right. The Vice-President of the United States, initially added to the Obama campaign to add foreign policy gravitas to the ticket, has come out and questioned whether the Taliban are our enemy. Let’s get right to the context, which the media will inevitably hype in an effort to conflate an amazing gaffe with straight-talkin’, straight-shooting’ foreign policy from the VP. Biden was answering questions from Les Gelb for a Newsweek interview, the full text of which you can read here. The subject matter of the interview ranged considerably across the foreign policy spectrum from Afghanistan to Iran and China. So the vice president claims the Taliban is not really a U.S. enemy. But a bill just passed Congress says any form of support to the Taliban would effectively make anyone a terrorist stripped of their civilian rights and detained indefinitely under military jurisdiction. It seems pretty clear that’s because the Taliban is a U.S. enemy, apart from any concerns of the NDAA itself. Add that to the fact that U.S. soldiers are killing — and being killed by — Taliban fighters every day, and have been for 10 years, and you have a truly monumental gaffe even by Biden standards.